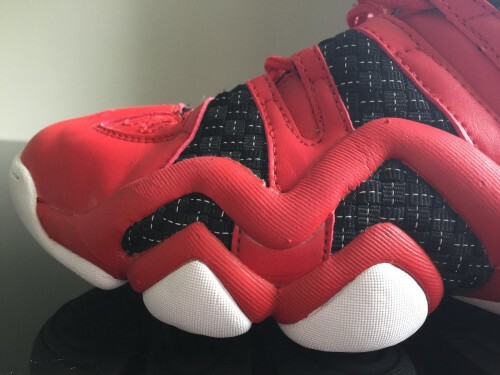 Some people may look at the adidas Crazy 8 as a relic, an artifact, or just another retro model with a million colorways. It’s an 18-year-old design based on a platform that adidas doesn’t have the rights to anymore (Feet You Wear), and to the uninitiated, it simply may not seem relevant. But for the older, more mature sneakerhead and some of my other veteran reviewers, the shoe remains a performance beast and a rock solid on-court option in 2015. 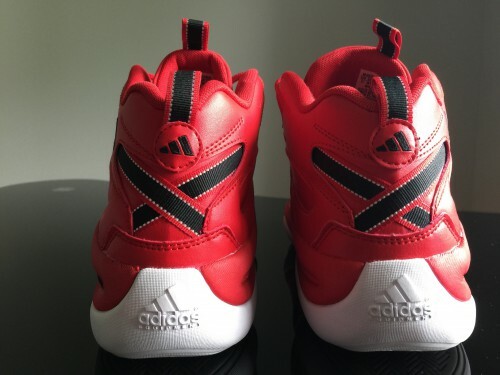 Upon first glance, you instantly recognize the Crazy 8 as a 90s shoe. Initially released in 1997 as a Kobe Bryant endorsed model, it’s got strap-like lace loops, a rounded outsole and midsole that wraps up around the foot, and leather everywhere. It looks bulky, heavy, and fairly cumbersome. But all those elements I mentioned give it a fantastic fit from heel to toe. I went a half-size down with my narrower foot and am happy I did. It’ll accommodate many foot types and break in nicely after 3-4 wearings. The lace loops (like a predecessor to Dynamic Fit straps) that hug the shoe cinch up tight and the heel/collar area has crisscrossing loops running around the heel for some extra security around the ankle. The idea behind FYW was to allow the foot to move as naturally as possible by embracing the shape and structure of the foot. With that in mind, the midsole wraps up higher than most shoes and is rounded on the edges for a more natural feel and it really locks the foot onto the footbed of the shoe. Ankle support and heel fit is just really, really good. Having a primarily leather upper is nice too, because it flexes and creases naturally while conforming to the contours of the foot better than most synthetics. My only real gripe was a pressure point on the outside of my foot about halfway down where midsole wraps up around the side of the foot, but it went away after a few wearings. 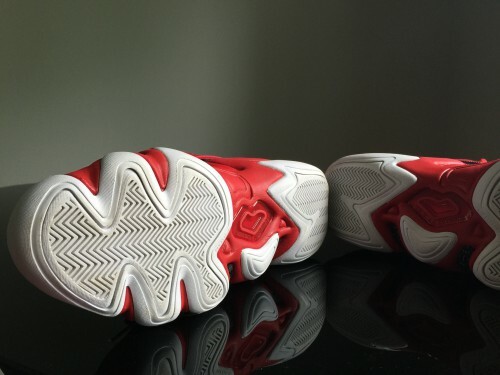 Walking around in them straight out of the box, the Crazy 8s will feel a little clunky. But that’s only because they aren’t fully broken in and you probably aren’t quite used to that outsole yet. On-court, it’s a different story as the shoe loosens up and flexes at exactly the right spots all while giving you plenty of support. It’s almost hard to look at the shoe and believe that it’s butter smooth underfoot, but give it 4-5 hours of good runs and it’ll surprise you. For once, it’s a shoe that achieves smooth transition without sacrificing all the support or making the midsole a little slab of foam. The overall cushioning package is very good, but it is also the only aspect where the shoe shows its age in regards to the midsole material it uses. On one hand, the court feel is incredible – like the best you’ll find in the game right now. The thin, firm midsole and contoured outsole keep you glued to the floor on any type of movement. Because of that, the responsiveness is also pretty good. The genius flex grooves allow your foot to flex at exactly the right spots so that you move naturally and dynamically. You won’t get much energy return from the midsole, sapping some of the responsive feel you’d get from Micro G or other foam compounds, but it is still very good. If you’re looking for impact protection or expecting a more plush feel though, the Crazy 8 might not be for you. 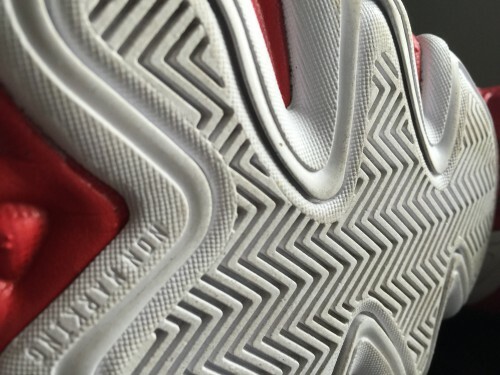 It’s very firm and although the engineering of the outsole makes it great for court feel/responsiveness, it doesn’t hide the fact that it’s a little harsh feeling from a straight comfort standpoint. The support is fantastic however, thanks to a perfectly placed midfoot pod and the traditional Torsion midfoot system. The shoe plays a lot lighter than it feels in hand. I did swap out the stock insole (a very thin piece of foam in the model I bought) for a leftover Crazy Comfort insole from an old pair of Crazy Lights that came with two insole options. I normally hate insoles because they kill court feel and always made me feel too high off the ground, but the Crazy 8 sits so low and wraps the foot so well that it’s actually perfect. A good pair of insoles helps the step in comfort quite a bit. Traction is outstanding. Thick rubber with deep herringbone grooves and perfect flex points – pretty much a recipe for good traction. The firmer rubber outsole should hold up well outdoors too. Shoes were built differently back when the Crazy 8 was introduced, and this thing reflects that: it’s built like a tank. While it plays much lighter than it feels in hand, the Crazy 8 doesn’t skimp on durable materials. 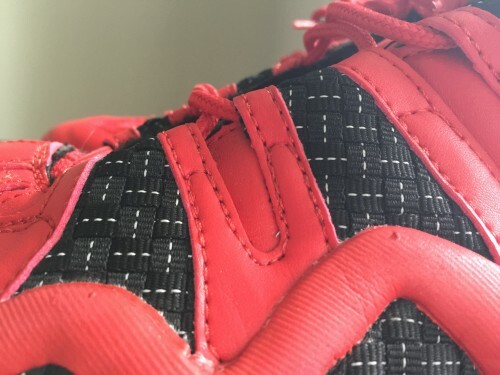 The upper is mostly leather, while this scarlet colorway dropped in some woven panels on the lace straps (the 3M accents were an oh-so-nice touch also). It’s rock solid from top to bottom and I anticipate it being one of the more durable shoes I’ve owned. 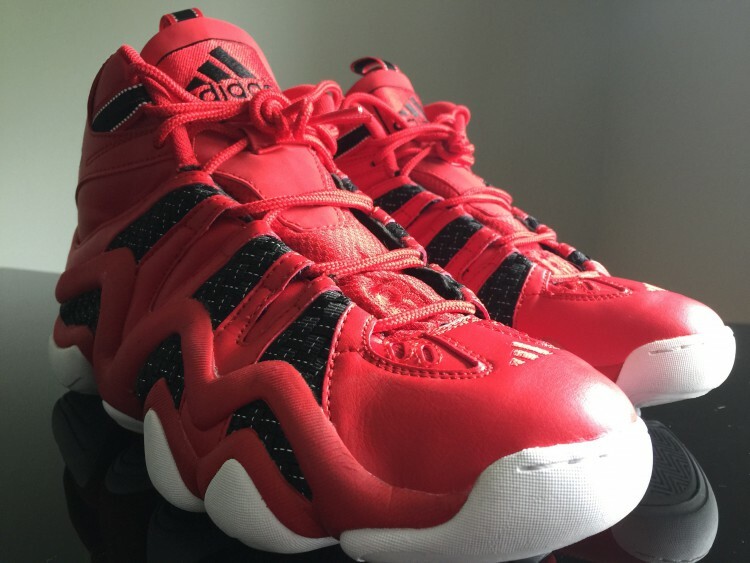 The Crazy 8 may be an outsider in today’s shoe market but it’s definitely not outdated. While synthetic uppers, advanced cushioning systems and feather-weight shoes all have their merits, the Crazy 8s only purpose is to lock you in, move with you, and take any beating you put it through. At $110 (many colorways are much cheaper online), it’s an awesome value and a versatile shoe for many positions – probably best suited for a slashing 2-guard or 3/4 wings and posts. It’s staying in my rotation for the great fit and support, and you should consider adding it to yours as well. Great review! Did you feel a lack of midfoot support? My real deals fell apart after 3 years of service. I will probably be getting this as a replacement. Just wanted to ask if you felt a lack of midfoot support. I think its weird though my retro real deals always felt like a more plush setup not lunar soft but a lil bit softer than eva. Is this firmer than regular adidas eva? Nope, I believe I included a pic of the Torsion unit and the midfoot pod and stated that it was really good in the paragraph next to it. 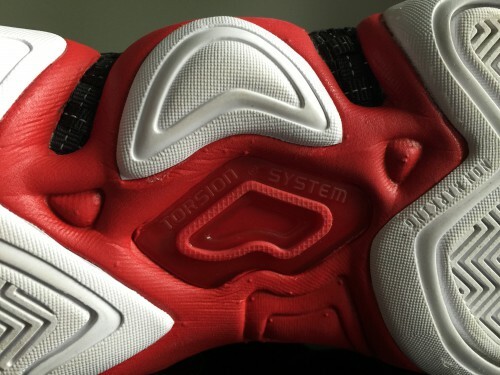 With a leather build and the FYW build, midfoot support was never in question with these. I don’t really have any adi shoes to compare it to other than my Crazyquicks and Rose 4.5 & 5, but it definitely didn’t feel plush – especially with the stock insole in there (which was worthless). Those other shoes are designed totally differently too, so it’s not really an equal comparison. Compared to most shoes on the market, I would say it’s more firm though and I think I put it farther to the left on that cushioning slider than I have any other shoe. Ahh gotcha didn’t catch it the first time. I will be getting a pair now for sure! I anticipate that the leather will stretch around my wide foot. Its me that said it wrong what i meant was that the foam the real deal used was impact absorbent thus giving the sensation that the foam was plush even though it wasn’t cause i put it on after writing the comment to be sure it was just good foam my fault. Damn man so may shoes i want to get! I think you’re anticipating a lot of new releases cause i know i am! Next pair will probably the crazy light boost 2015 looks solid. But the new lebrons, roses,lillards,j walls, kyries, kobes, kds, the new soldiers,superflys are up there too so many shoes so little money. But priorities first always…. Is this the lowest-to-the-ground shoe you’ve played in? Better than the crazyquicks/supernatural creators? Me again sorry I’m torn in which i shall get. The superfly 2 po’s,the crazy 8’s, the hyperrev 2015, and the rose 5. Can you help me out by picking your personal preference between these shoes? I know you haven’t reviewed the 2 pos but the midsole outsole is the same as the regulars though and the upper fit better too. All of them seem great performers and i am really just waiting on your opinion. All of them fit and feel great on foot too. Hope you can help me again bro and if i may ask whats next? Soldier 8’s? PS. Recently bought the kobe 9 em thanks to your chart and comparison and i must say all that you’ve stated is the same thing im experiencing with them. Hope the lunar can hold up for me as i am sure i weigh less than you. I’d say Rose 5s out of that group. Best combo of lockdown, responsiveness and support. Just a great all around shoe for my preferences. Yes Soldier 9s are on deck. Should be picking them up soon. Great and very informative review! 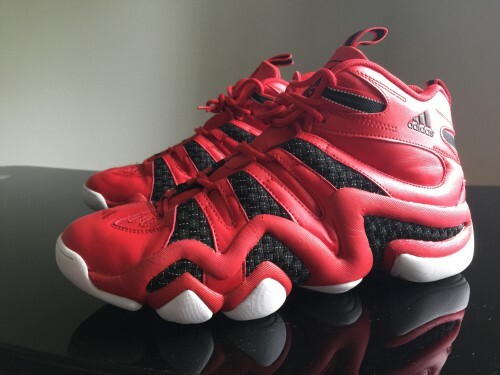 I have a question for you, would you prefer Crazy 8’s over Crazyquicks nowadays?? I consider FYW tech as the predecessor of Puremotion. 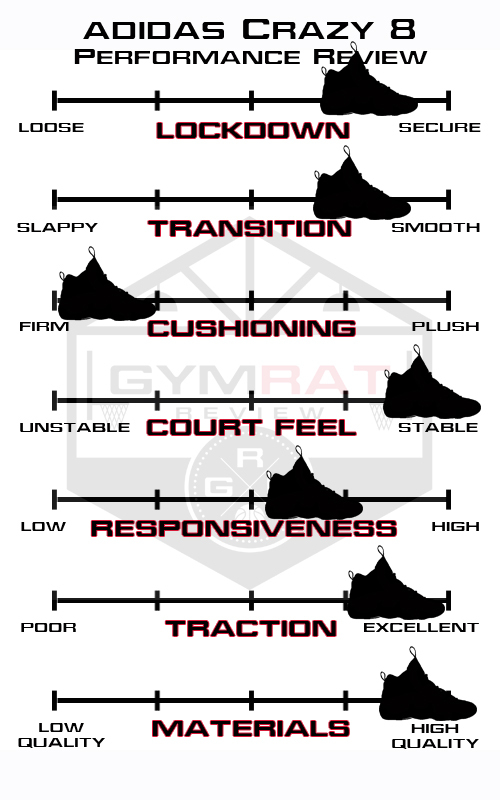 hey, any idea why shoes like kobe mentality, cp3 vii are very convinient and good for me, but after 1-2 hours i start feeling alot of pain and just cant move my feet get itchey weird feeling and i get pain, and in other shoes like hyperdunk, hyperfuse, jordan superfly3 i can wear them all day without pain? Probably just has to do with the fit for you, for whatever reason. If you try a shoe on in store and feel any hot spots or weird flex points, that could be an indicator too.